If you’re in the business, you already know plenty about dewatering. But , if you’re new to the industry, or you’ve simply heard the term and are wondering exactly what it is and how it’s accomplished, allow us to give you a brief overview. First, to put it simply, dewatering is the removal of water. This process is used in many industries but commonly referred to in construction and wastewater when water is separated from solids through a variety of different pumping or filtering processes. Construction dewatering involves pumping from wells or sumps to temporarily lower groundwater levels, to allow excavations to be made in dry and stable conditions below natural groundwater level. In wastewater treatment, dewatering is the part of the process where sludge is reduced in volume and converted from a liquid to a solid. 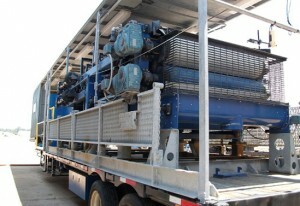 If you’re in need of mechanical dewatering equipment, trust the professionals at Sandling Industrial Services. Our mechanical dewatering systems are optimized to help you remove all types of solids from your waste water. Our belt filter and chamber filter presses utilize sophisticated methods that separate your solid and liquid phases. We have the knowledge and skills to help you get the job done. We service the entire United States, so call us today for help with your dewatering project.